1. Teerenpeli (CITY Ranking No. 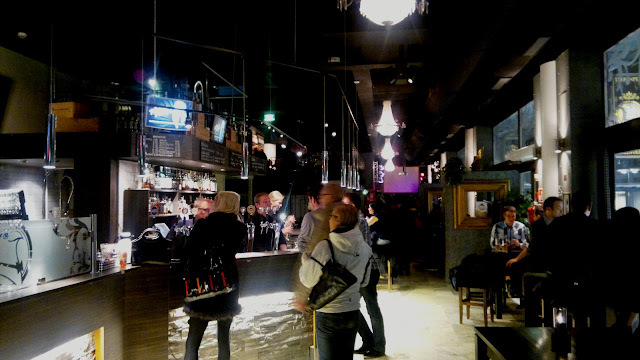 1) The beer restaurant, how it is called, is located in Kamppi just a few meters away from the big shopping center. They serve their own brewed beer. You can choose between six to seven different beers from their brewery in Lahti. (They already received lots of prizes for their beer.) I highly recommend you the Sauhusanttu, a smoky dark beer. It’s quite strong though and might not be everyone’s taste. But if you are new just ask for the bar tenders help for your choice of beer. They also let you try before ordering. Don’t forget to ask also for the changing season’s beer. Apart from that they also have a big variety of bottled beer mainly from Belgium and Germany. If you come in hungry try one of their famous panimos (toasts). They smell really good and taste even better. The dark and cozy interior makes it easy to relax and chill out here. Teerenpeli is extremely popular on Friday and Saturday nights as a place to go before going to a club. So try to avoid entering there between nine and eleven. It might be impossible to find a table. 2. Stone’s (CITY Ranking not in the top 5): Stone’s, located in one of the side streets of Aleksanterinkatu, is a nice cozy place with dark interior that has more to offer then what meets the eye at the first glance. On two levels you can relax in comfortable booths or at small tables. They offer a wide selection of beer some of which I bet you’ve never heard of before. Ask the waiter to have a try before you decide on a beer. The screens in the pub might also help you with your decision. They monitor the beers consumption there so you know exactly what the most popular draught of the day is. Hungry? No problem. They also serve food. Get a snack like the tasty beer bacon meatballs for reasonable prices. You can save some money with your S-bonus card here since Stone’s belongs to the S-group. Like in most of the Finnish pubs they also have a big selection of board games. So go downstairs and play a round of Kimble with your friends. 3. 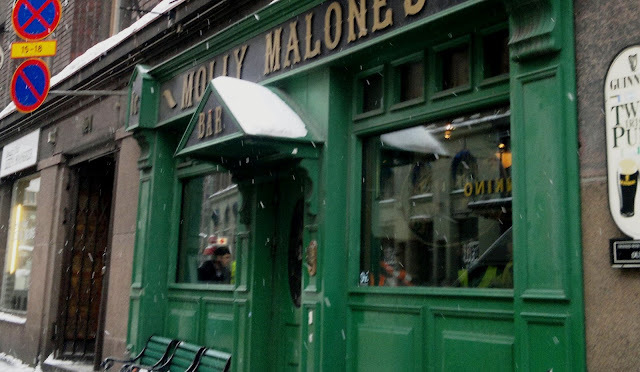 Molly Malone’s (CITY Ranking No. 3): The probably most original Irish Pub in whole Helsinki. Also located close to the metro station Kaisaniemi Molly Malone’s offer exactly what you expect from an Irish Pub. You get your tapped Guinness as well as Newcastle Brown Ale. But also other draught beers like Australian Fosters or Finnish Lapin Kulta are available. But Molly Malone’s has more to offer then what is obvious on the first glance. On weekends they open their second level for live music acts. And when you come up there you’ll be surprised how much space they have upstairs. With a second bar and numerous tables the airy room differs a lot from the narrow but cozy booths you find downstairs.